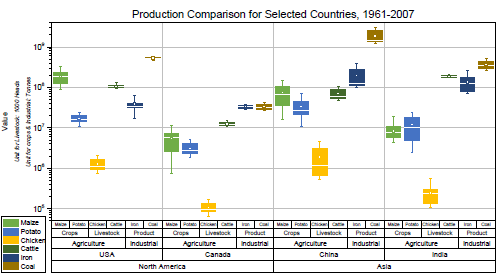 This graph compares production of 6 basic commodities by the USA, Canada, China and India. This plot is created as a Grouped Box Chart from Raw Data in Origin. You can create up to 5 groupings for these plots. In order to show grouping information in the graph, Tick Label Table has been enabled with 5 rows in the X axis.